It's all random. We wander around through our days... Sometimes we zig and sometimes we zag. Out here we never know what our day will bring. Today, it brought us new friends. Our time here in Charleston, SC grows short. The cold fronts are coming through, reminding us that we vowed to be well south before winter finds us. We pretty much had our remaining time here at St. John's Yacht Harbor pencilled in... when we got the message that fellow Cruisers, Kathe and Gary (S/V Tribasa Cross) would be in town and wanted to meet up! Well, plans are meant for changing! I consulted my Touristy Stuff Wish List... We would still like to drive out to Wadmalaw Island to visit Irvin House Vineyards and the Firefly Distillery. A new plan is born! Gary and Kathe picked us up and we started getting to know each other on the short drive out into the beautiful countryside. This late in the season, we found that there wasn't much going on at the Distillery or the Vineyard... the plants are in their dormant stage and the bottles are all corked and shipped... but the TASTINGS will go on! Lets face it folks... that's all we're really after anyway! First, we bellied up to the tasting bar at Firefly Distillery and let Wanda guide us to the best flavors... We each got to choose six from the many flavors of Vodka, Moonshine, Liqueurs and even RUM made right here... from GRAPES??? Bruce and I chose different flavors so that we could share and taste more flavors... then Wanda added a couple more of HER favorites to our list... giving us a pretty comprehensive sampling. Normally not the best decision makers (Libras!) when presented with so many choices... Bruce and I had an uncharacteristically easy time making our decision on which flavor to take home... A jar of Caramel Moonshine made its way into our bag... Heavenly on the lips and just perfect for sippin' on a cool fall evening in a quiet anchorage. Feeling very relaxed and a little bit hungry, we traded our newly purchased bottles for the picnic lunch we had brought along. The sunbathed vineyards and rolling tree strewn lawns of the property provide a very lazy and laid-back spot perfect for a picnic with new friends. Even further from my imaginings would be if you throw into this vignette... a Mini-Brama (I later learned her name - I DeClaire!) She seemed to be eyeing the apples that Kathe and Bruce were munching. The cow was just turning to leave us when Bruce, being the softie that he is, got up and took the unfinished apples and offered them to I-DeClaire as a snack. She went for it! She finished them off in record time and then turned her backside to us and melted back into the vineyard as if it had never happened... I think the Vodka samples and the sunshine are starting to affect me! The Distillery and Winery are right next to one another on the property. The buildings are shaded by tall trees dripping with Spanish Moss. It's such a peaceful place, perfect for an afternoon getting to know new friends. Gary volunteered to remain our DD and dozed outside in a sunny chair while Kathe, Bruce and I went into the Winery for our next tasting. We sat at tables right next to the vats where wine was fermenting. We watched the video showing how the wines are made while the samples were distributed. We tasted five different wines, all made from the muscadine grapes grown just outside the door... They were all very good and sweet, as the muscadine is a very sweet grape. We found ourselves driving to a dead end at the end of the lane... but it was a GOOD thing! We happened upon the Bears Bluff National Fish Hatchery. The WHAT???? I know! Kathe and I almost didn't get out of the car when Gary pulled up and turned the engine off. But the guys had been so good, and their eyes were alight with the promise of seeing some fish... We couldn't say no. A park ranger just happened to be there taking a break. We started asking questions and that's all it took. We were hooked. We got a private guided tour that turned out to be, in my opinion... the highlight of our day! The Red Drum (or Redfish). The fish are hatched and grown to a size then released back into the wild. They are genetically tagged and then studies are done with "caught fish" in the Edisto River. They are then genetically compared to the hatchery fish. The yearly results are documented and compared to fishery records to determine the facility's success in helping this "overfished" species in making a comeback. 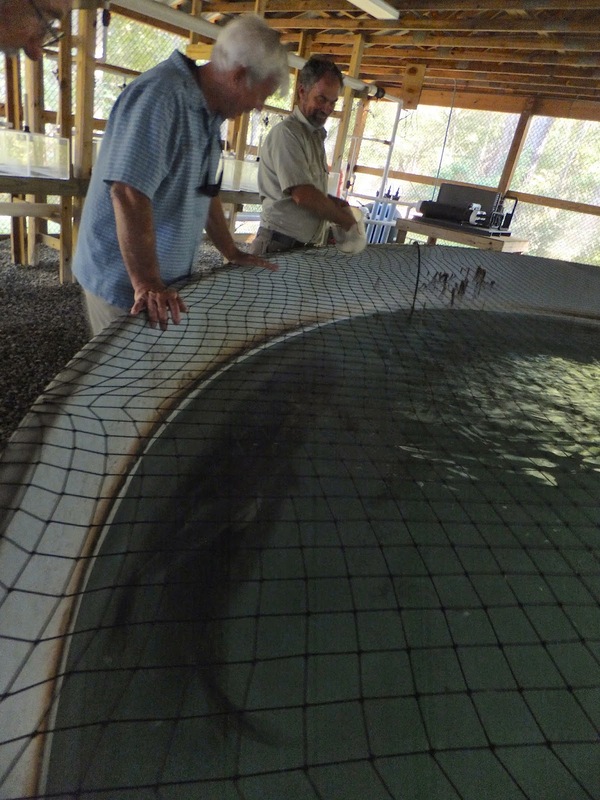 We saw some really BIG redfish who are a part of another study performed here, on different types of radio tags. Some are externally tagged, while others receive internal tags. These are inserted inside of the fish. The tagging devices have grown smaller and smaller over the years and it is important when tagging a fish internally, that the tag not "work its way out" of the fish as they swim along. EEK!! I guess it's all a necessary part of the science of fish... but it seems kind of mean. Moving on to the next type of fish being studied here.. the American Shad. There are areas where these fish are declining while other areas still enjoy abundant numbers. The fishery is sampling fish from the areas where they are abundant in an effort to determine if there are any differences between those fish and the ones in the areas experiencing a decline. It seems to be a long and ongoing process that will take years to complete. The shad are tiny fish. They are kept in tanks according to their age and chemically marked. Fish caught in the wild are tested against these chemically marked fish to determine differences in growth as the exact age of the marked fish can be easily determined. To other buildings where the teenagers are housed... They have tanks full of fish of increasing size. The larger the fish, the fewer are kept in the tank. They want to encourage natural growth and overfilled tanks can cause the growth rate to decrease. And bigger... and bigger they get. These are over a foot in length! They net the tanks because raccoons have been known to break into the buildings and make off with the fish! These fish can reach lengths exceeding 13 feet. They live for years, some here are over 25 years old. Extensive studies are being performed here about the spawning habits of these fish. The temperature, as well as the level of salinity in the individual tanks can be manipulated to simulate the seasons and the location (fresh water or salt), which cause the fish to spawn. The eggs are collected and incubated in multiple small tanks until they hatch. These tanks lie unused now as there are no eggs or babies here today. But they are kept ready for the new batches which occur annually. A single mother can produce about 35 lbs of roe. These have to be washed and counted... by hand, so that they can be separated into the tanks. Then when they hatch, the babies are again counted and separated into tanks. I wonder how many marine biologists knew when they were in college, that they would end up counting fish! The facility has elaborate home made filter systems. They use a natural filtration method in which the water is passed through a large box full of spongy balls. These balls allow a larger surface for the naturally occurring bacteria to attach themselves to, so that larger amounts of water can be filtered through a smaller area. The bacteria neutralize the ammonia from the fish waste. While we were on our way to the big tanks... we paused to pick up some treats for the big fish! A very nice marine biologist answered our many questions while she performed her daily task of worm washing. That's right... she went to college so that she could WASH WORMS! Well of course that isn't all she does... She is involved in studying the fish at the different stages in their lives so that we can understand more about keeping the fish healthy for future generations. She explained how she dissects fish and examines the ringed bones in their tiny heads to determine their ages... Cool stuff! But today, she's washing worms! These fish are longer than we are tall! The huge fish looming in the dark shadows began to swim over and slurp the worms up from the bottom of the tank. Today we took a chance. All four of us committed to an entire day with people we didn't know at all. As it turns out we now have great new friends with whom we have a shared experience on which we can build our new friendship. No more are we "random". Months or years from now, when we meet again... we can laugh and remember the day when we had the picnic... and THOSE WORMS! And we'll raise another glass in toast: "To Making Friends From Random People!". Great post. We have been to Charleston twice and never realized that these attractions were there. But about your new friends. Making friends is one of the wonderful things about the cruising life style. The barriers and risks are low and the rewards can be great. We are still close with cruisers we met on our first cruise when everything was so vivid. However, I think that the reason we can strike up friendships so easily is that if we make a mistake all we have to do is weigh anchor. Pick a bad friend back in the 'hood' and it can plague you for years. LOL Karl I love the way you think! We miss you guys and hope to see you soon OUT HERE! Won't that be a hoot? Hopefully if we find ourselves in the same neighborhood, you won't pick up your anchor and move! Charleston was such a neat place. We were there six weeks and didn't get to do everything on our list. We'll have to start there next season and finish up.